We’ve all done it. You’ve made yourself comfortable on your sofa, put a couple of pillows under your head, sprawled out, relaxed watching your favourite show on Netflix and suddenly you open your eyes and it’s 1am. So, you drag yourself off to bed and wake in the morning feeling horrendous. Is it because of the broken sleep? Or could it be something else? Experts say that sleeping on the sofa can cause a number of different health problems such as digestive and physical pains. 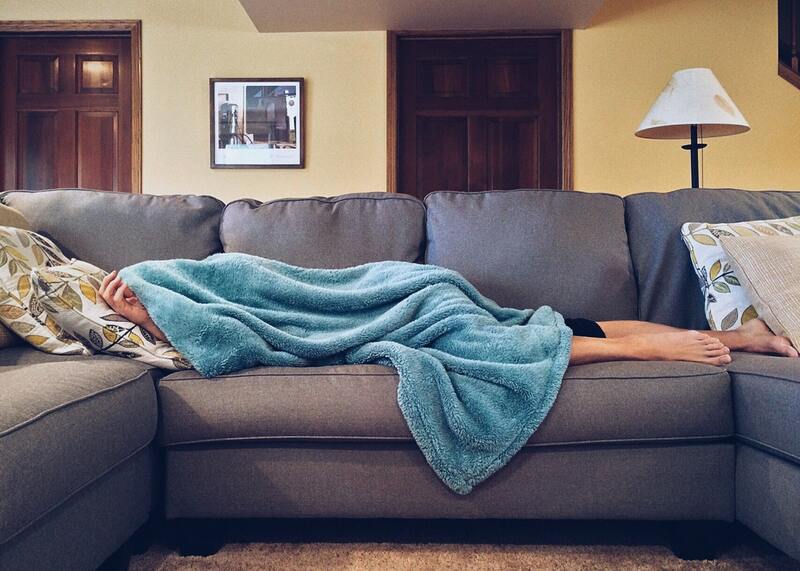 So, what does sleeping on the couch really do to us? An incorrect sleeping position can lead to some serious medical conditions. Regularly falling asleep on your settee can strain both your back and neck muscles and can affect the alignment of the spine. When in a bed, people tend to sleep on their side which helps to align the spine however the dense material of your sofa, though it may be comfy for sitting, is not designed for night-time comfort as it doesn’t comfortably allow a person to reach those crucial deep stages of sleep and we find ourselves waking up more frequently to realign our body. Research has found that people who suffer with back problems, and who otherwise have not suffered a trauma or accident, may be experiencing problems due to slouching or lying on their sofa’s. Poor posture and body positioning can be caused from long periods of time on the couch due to the pressure placed on the spine that would be alleviated from a comfortable mattress. Spinal problems and back pain can get progressively worse and trigger other things such as slipped discs or degeneration of discs as well as worsening of the joints and muscles or ligaments that support your body. Digestive complaints have also been on the rise in recent years and these could be linked to the amount of time spent on the sofa. For example, an increase in people returning to their couches after eating a meal can bring about gastro-oesophageal disease in which acid comes back up from the stomach causing inflammation and discomfort. This is equally true when eating ‘TV-dinners’ as slouching and slumping straight after a meal can exacerbate any digestion malfunction or issues causing internal inflammation. So, what can you do to prevent any health problems arising from sofa use? Some people find they fall asleep easier on the couch and actually have trouble sleeping in a bed. If this is the case, it’s advisable to see a GP who can recommend the best course of action. There are a number of different sleep aids to consider ranging from natural or herbal capsules designed to aid sleep, sleep masks as well as natural therapies including apps for your phone or tablet designed to help you get off to sleep. In terms of your sofa, be sure to go for classic designs which never go out of fashion. Vintage sofas and chairs such as wingback chairs and high-backs on sofas can offer more support than other settee’s and so may be better to avoid physical pains. Avoid sofas that are too hard or too squishy and always choose foam filled as they offer a higher level of firm support to the body. Why not consider a recliner? Having an adjustable seat can help to readjust body position and aligns the body so as to avoid slouching. Have you ever suffered health problems from your sofa? Be sure to get in touch and let us know via Facebook or Twitter.